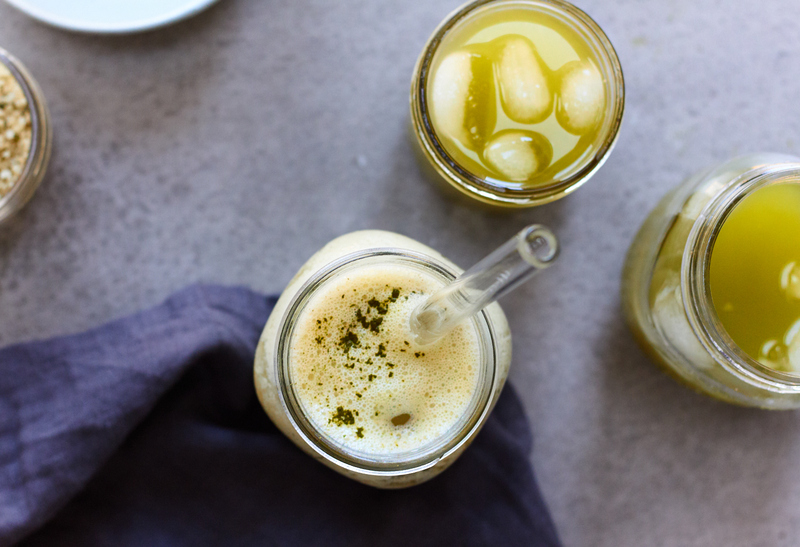 How to Make an Iced Matcha Coconut Latte 2 Ways! We have a thing for matcha lattes over here. And it seems that a lot of other people do too, seeing that matcha lattes are appearing on menus at so many different coffee shops and cafes. The thing is that buying matcha lattes can get quite expensive and often have added ingredients, like sugar, that we don’t love. So, making matcha lattes at home is a great way to not only save money but also ensure that you know exactly what ingredients are used. Matcha is made from high quality green tea leaves that are turned into powder. This means that matcha is much richer in flavour than a normal green tea as well as going to give you a mega dose of antioxidants, including EGCG (Epigallocatechin gallate), the famous component in green tea that’s linked with preventing free radical damage and cancer. We have many different ways of preparing matcha lattes at home and during the winter we love to sip on a hot cup of steaming non-dairy milk frothed together with matcha. However, in the summer, we need icy, refreshing beverages. The most exciting part about this is that we can use coconut water in our matcha lattes (we wouldn’t recommend heating up coconut water- not only would it destroy the nutrients in it, but it just wouldn’t taste good). Coconut water is a wonderful source of naturally occurring electrolytes, including magnesium and potassium. It also naturally has a sweet taste to it. When you buy coconut water, check the label and make sure that you get a brand that doesn’t have any added sweeteners. Here are two different recipes for a refreshing, iced matcha latte. The first recipe is super duper easy and only requires two ingredients. Using coconut water means that you can avoid using other sweeteners, like sugar, because it will naturally sweeten the matcha. The second recipe is a little bit more complex and rich, but still super easy to whip up, and a great choice if you want something creamy but dairy-free (it’s almost like a matcha smoothie). The second recipe also contains some protein and anti-inflammatory fats from hempseeds, which is a great option if you want something more filling. 1. Simply combine the coconut water and matcha in the blender. 2. Blend for 30 seconds or until creamy and smooth. 3. Pour over ice and serve. 1. Combine all of the ingredients in the blender. 2. Blend for 1 minutes o until creamy and smooth.